I have taken the decision to move my blog to Wordpress because of some of the features I can get via that provider so you will no longer be able to follow my blogs via Blogger. 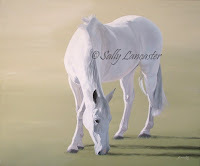 The new address for this blog is http://sallylancasterartist.wordpress.com/ so please change your favourites, subscribe to that blog via email etc and delete this Blogger address and I look forward to seeing you over there! If you've any questions, please don't hesitate in asking. 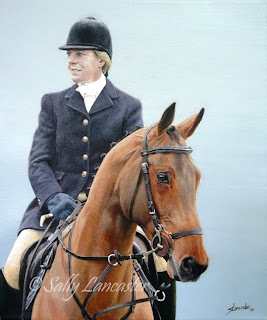 This was my latest commission of Lady Arabella Moger and her favourite horse Rupert, painting size 10x12". I have to say that I really enjoyed this painting, all the little details and Rupert is such a stunning horse that he was an absolute joy. Also, I was grately helped by having a fantastic photo to work from, taken by photographer Emma Harris. I'm glad to say that the painting has gone down very well with both the lovely lady who commissioned it and Lady Arabella Moger, whom it was a present for. Blimey, where's the time gone? I haven't blogged on here in ages and I must apologise for that, Christmas and the New Year got in the way and I didn't realise how long it had been. Well, I for one am glad it's a new year. 2009 was unfortunately a very bad year for many reasons but I'm already feeling far more positive about 2010. I'm hoping to be able to produce more of my own original paintings this year and get back to exhibiting and am also looking at a couple of 3 day country shows to attend to help promote my work. In the meantime, I'm glad to say I'm currently busy with commissions and below are a couple that I have recently finished. The first is of Westie, a stunning grey and is a large painting at 24x20". I really enjoy doing different posed paintings like this, it's great to have a change from the usual head portrait. And this is Cab, a flat coated Retriever from America, yet another handsome boy. This painting was also quite large at 20x16". Unfortunately, I'm having problems sending out paintings at the moment though, I need to send both these paintings via courier but England has had some very unusual snowy weather of late and the lane up to our house is covered in snow and I'm not holding out much hope that a courier will attempt to drive to our house to pick up the paintings so I need to sort something out! Quite what, I haven't yet figured out but I need to find a solution. 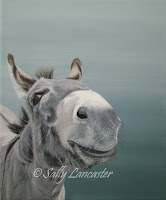 I am also happy to say that my donkey painting "Are You Hiding Carrots?" has been made into Limited Edition Prints and can be found in my print section. As with all my prints, there are two sizes available so please go and have a look and buy, buy, buy! And finally for some very exciting news! Two of my original paintings, 'Meandering' and 'Arabian Beauty' have been selected to be displayed permanently at the Royal Ascot Racing Club. Again, I need to work out how to get the paintings sent to them because of the snow and they need to be there by Friday but it's an amazing opportunity and hopefully the start of a successful 2010! Here is my latest commission, Archie, canvas size 14x18". Archie was an absolute pleasure to paint. It was a great photo plus he's a very handsome horse. His coat had loads of interesting colours to put in including purples and pinks. You learn to pick up on all these different colours when you've been painting for a while. Also, their surroundings are often reflected in their coats, especially when working on full body paintings and you will be able to pick up on blues on their upper halves from the sky and greens on their undersides if they're stood on grass. I also had a chance to produce this little donkey painting. I actually started it last year in the hope of making it into Christmas cards as I was going to add a bunch of mistletoe to the card hanging up in the top right hand corner but I never got very far with the painting. It's a small painting for me, canvas size 10x12" and it was great fun to do. Donkeys are so cute and a real favourite of mine so I might try and do some more paintings in the future. I'm also thinking of getting this painting made in to prints so keep an eye on my Limited Edition Prints shop. The original is now available for sale as well so if you're interested, please contact me. Well, I'm back at last! :-D It's been a while since my last posting on here but I had been really busy with a big painting only to completely forget to take a photo of the finished version! It was a painting for a wedding so I'm waiting to hear from the bride to see if she can get a photo of the painting for me, but of course she's on honeymoon at the moment. 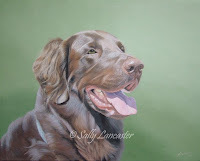 Meanwhile, I have just finished another commission, which is of William, another very handsome Cocker Spaniel. This painting was size 12x16". His owner won the prize of having his portrait painted in a raffle to raise money for Cockers Online which is a brilliant source of information about all things Cocker Spaniel and also a great place to talk with owners. Here is the painting of William. Commissions are finally starting to pick up which is great as it's been a very quiet year with the recession and I had been worrying! Although bizarrely I still haven't had any enquiries about Christmas so I hope people aren't leaving it to the last minute! 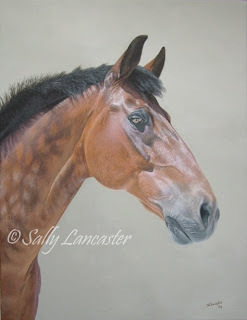 I also need to work on some of my own equestrian paintings, especially as I have been invited to be part of a permanent exhibition at the Ascot Jockey Club and I currently only have a couple of paintings they can display! I sometimes wish I could paint quicker but then I wouldn't enjoy it so much! 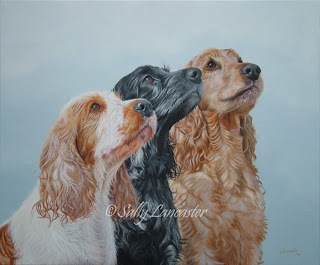 Here is my latest commission, a big 24x20" painting of three beautiful Cocker Spaniels, Stevie, Misty and Jimmy. I had totally underestimated how long this painting would take me, giving myself just 3 weeks and in the end it took me a month but their owner is very happy with the finished painting and even I'm quite happy with it! As an artist, you always tend to pick on your own work so if you're even vaguely happy with your painting, that's a good thing! I've also had a couple of one day shows that I've attended recently, the Monmouthshire Show and yesterday I was at the Frampton Country Fair. The Monmouthshire Show was held on a Thursday and although I have as yet not got any commissions from it, it was a really busy day with people constantly in my tradestand tent. I was working on the above commission whilst there and that seemed to attract a lot of people in as well but it still amazes me how much people underestimate how much time and effort we as artists put into our work and how that calculates as to what we need to charge for a painting. Not helped by the recession, I know, but it still amuses and amazes me at the same time. Frampton Country Fair seemed to be an entirely different type of affair, with not as many visitors and definitely not as many interested in visiting the tradestands. But it's always interesting visiting these shows and working out which ones will be worth attending again the following year plus this year I actually had decent weather for both shows compared to last year's wind and rain! It makes a huge amount of difference to the number of people who turn up at the shows and also it makes a huge amount of difference to your own enjoyment of the experience!! This extremely handsome fellow is Stan and is my latest commission. I had the pleasure of taking the photos of him myself and he was an absolute delight to photograph as he just stood in the yard, posing away with no need for a head collar. He did need his treats being waved infront of him to get his attention but we managed to get this shot after just a few minutes. What a star! 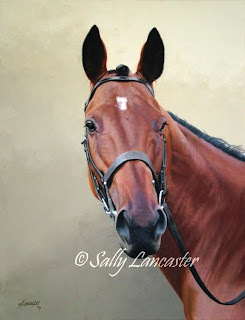 I really enjoyed doing the painting and am pleased to say that his owner is delighted with it. My next commission is of three Cocker Spaniels and I'm very excited about it as it's a brilliant photo to work from that their owner has produced, plus it's going to be quite a big painting, 24x20". Some people reading this blog may not realise that I have another blog which is my work in progress blog. I don't link to that blog on my website as lots of my commissions are surprise presents so I need to be a bit more sneaky about them, but as my latest commissions aren't surprises, I thought I would mention my other blog. If anyone would like to visit it, you can find it at http://sallylancasterportraitswip.blogspot.com.